Weekly Happenings: This past week has reminded me what the weather is really like during the summer in San Antonio. I am now realizing how mild the rest of the summer has been compared to what we’ve been experiencing. Due to that, we spent most of the week at home or in other air conditioned places. Hopefully with fall approaching it will at least cool down a bit! It doesn’t really cool down a whole lot until closer to Halloween, but I’d take even a ten degree drop right now. One super-fun thing we got to do was have lunch with my cousin Kelli and her family. They live up in Houston, but came down to take the kids to Six Flags. They met up with us yesterday and we had a good time chatting and visiting. What Paul’s Been Up To: Most of the past week the poor guy has been fighting either a major allergy attack or a summer head-cold. 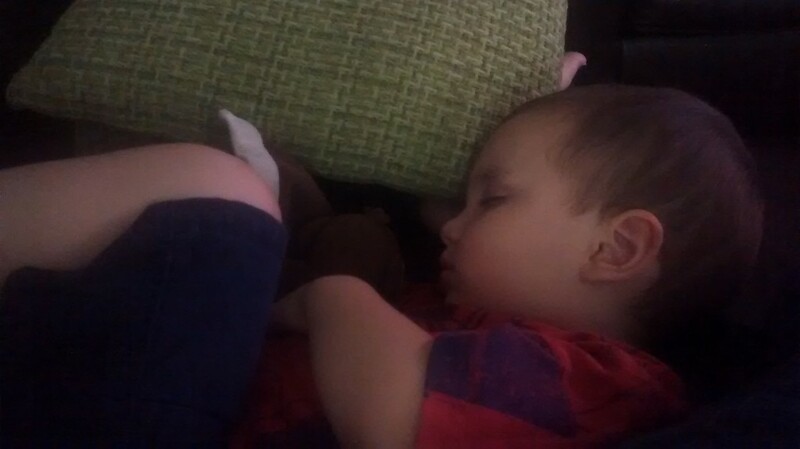 He’s on the mend now, but it really wore him out. What Sarah’s Been Up To: Just the regular stuff, mainly. I was able to have “girl time” a couple of times this past week, once at a Relief Society activity and once at lunch at Chick-fil-a with friends (Joseph played in the play place the entire time). One bummer thing that happened was that someone somehow got a hold of my debit card number and made a couple of large purchases (almost $1,000.00 worth of stuff). Luckily the bank caught it, called us, and we were able to start the process of getting the money back. I’m still waiting for my replacement debit card, but that will come soon. Until then, I can use cash or we can use Paul’s card or the credit cards (luckily we just finished paying them off). *sigh* Why do people have to be so dishonest?! 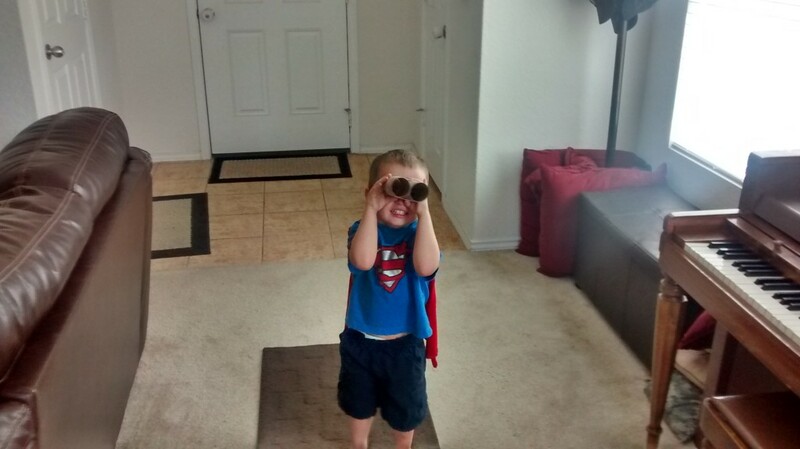 What Joseph’s Been Up To: He had the “play-date of his life” this past week. 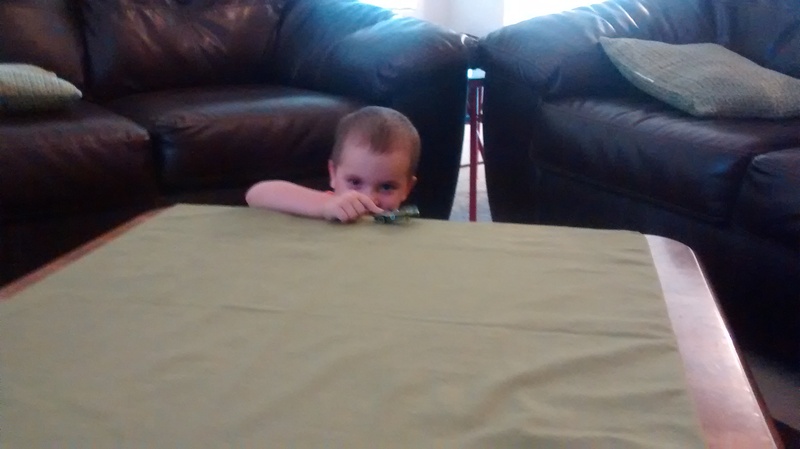 When I went out to lunch with my friends (to celebrate one of their birthdays), he got to play in the play place the entire time (I learned a while back that he won’t eat at Chick-fil-a because the draw of the play place is too strong, so I usually try to feed him ahead of time). I decided to stay as long as Joseph was happy, which ended up being almost three hours. He was happy the entire time (except for needing to be comforted after bonking heads with another kid)! 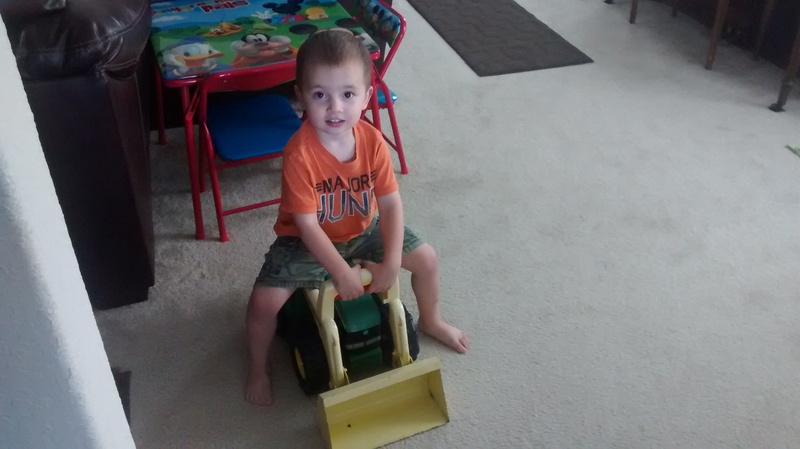 We also had to switch out his clothes from his 3Ts to his 4Ts. This kid seriously needs to stop growing so fast! His “inoculers”. Paul reminded me how easy they were to make. I took a paper towel tube, cut it in half, and held the two halves together with a rubber band and some tape. 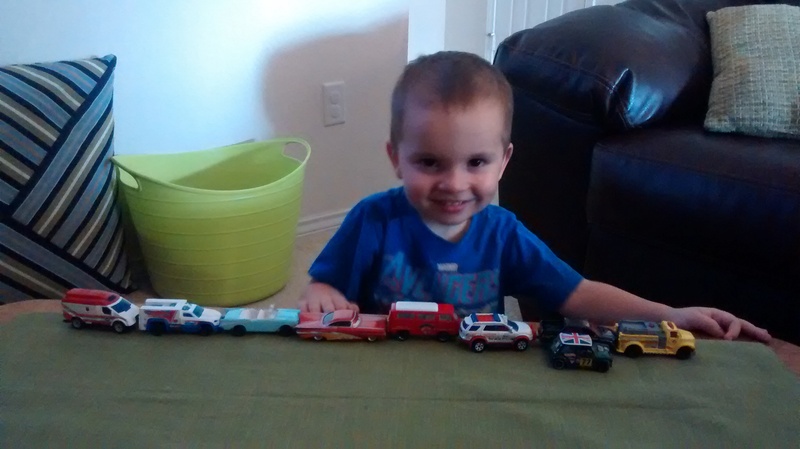 He was impressed with his line of cars and wanted me to take a picture of them. Since I like to have people in my shots, I told him to pose with them. 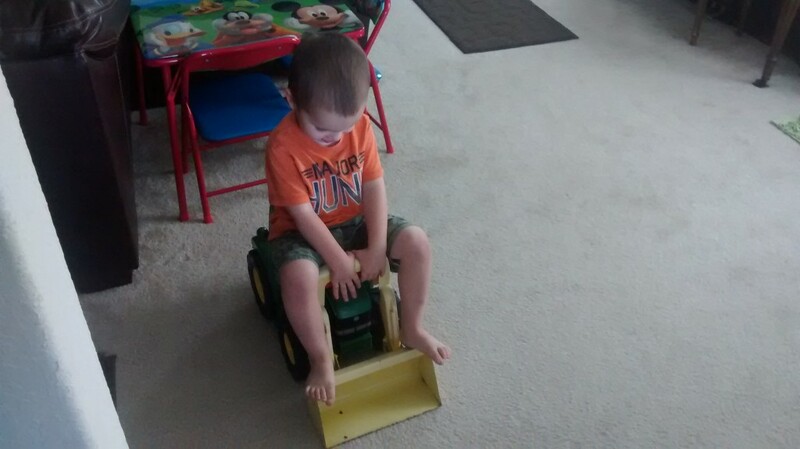 One of my friends was getting rid of this front loader toy, so I snapped it up. Joseph was ridiculously excited to get to take it home. I think that, with the exception of breaks for meals and diaper changes, he played with this thing all day. Post-playing all afternoon at Chick-fil-a. He asked to watch a movie and then curled up with his head on my leg. He slept like this for almost an hour. Then he crawled up onto my chest and slept for another 30 minutes or so. 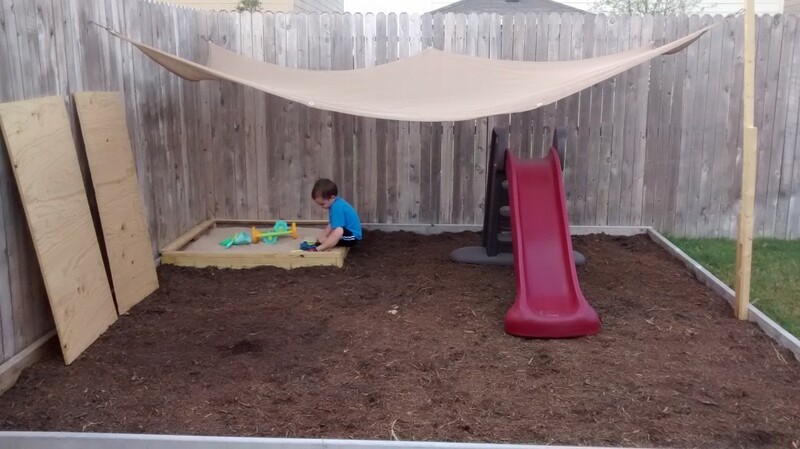 The finished play area. Paul still wants to seal the plywood covers and put rope handles on them to make it easier for me to lift them on and off. 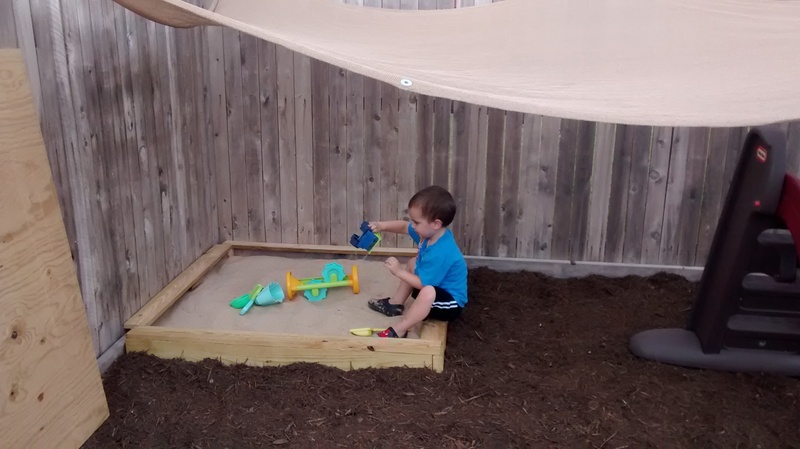 Joseph loves the rim that Paul put around the sandbox since it acts as a seat. 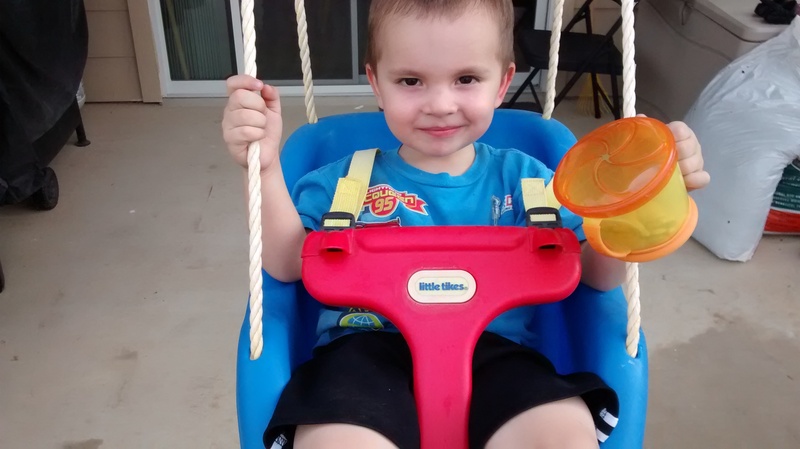 Swinging while munching on goldfish crackers. Could life be any sweeter? 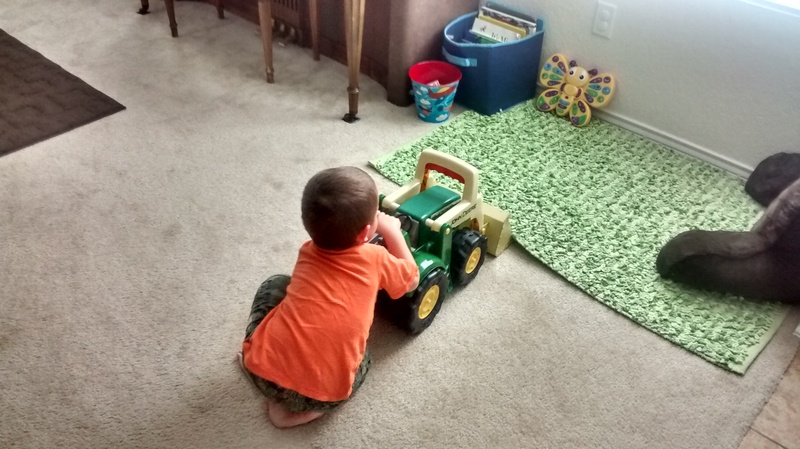 Making one of his race cars do tricks. Has It Really Been Twelve Years? !